Ponder was turned in to the Animal Control in Titusville because he was an “escape artist.” His owners left him outside in an unfenced yard, never allowing him indoors, with only an electronic fence to keep him contained. Needless to say, he broke through the fence and would wander the neighborhood. Ponder was unneutered and heartworm positive, and was scheduled to be euthanized. The TBVC rescued him from the shelter and he was treated. 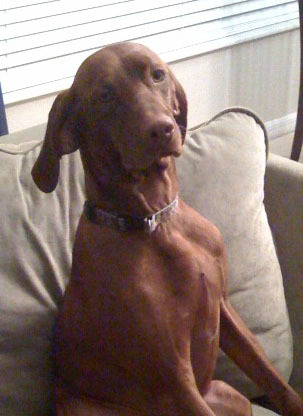 Ponder has a wonderful vizsla temperament and melts the hearts of everyone he meets. He was initially scared of coming inside a house, but now he gets to play with balls and toys, sleep on a soft bed, eat peanut butter to his heart’s content, and will grow up with his very own boy. He lives in St Petersburg with his new family, the Franks, and their golden retriever Sadie, and he could not be a luckier dog. 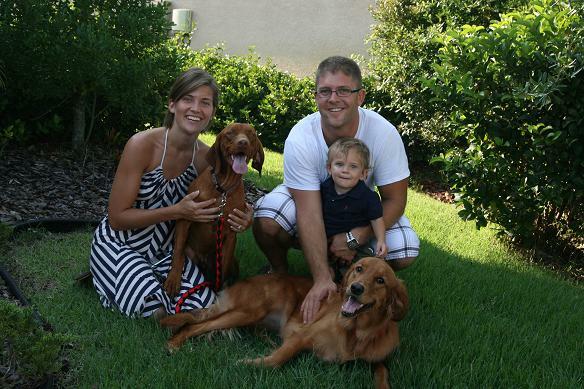 Thank you Lexia, Dustin, and Tavish for giving Ponder a wonderful home, where he will never be left outside again. Please remember that vizslas are not happy as outdoor dogs, and electric fences are not a good idea for this sensitive breed. Vizslas need human companionship and should not ever be left outdoors unsupervised.